Water has a million uses, from drinking and cooking, to bathing and...ok, so water has three uses. Now also using it as inspiration for gear, the dudes behind Latitude33. L33 is a line of tees, hoodies, and hats launched by a Newport Beach crew inspired by a love "for being on the water and the journeys it takes you on", but not "the Journeys it takes you on", since those're more of a destination retail experience for young, hip teens. 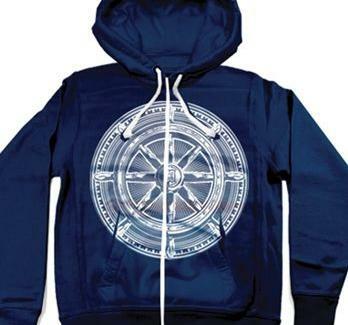 Heavier highlights from the line include the Helm Zip hoodie in black or navy (featuring a ships' wooden helm on the chest), The Life pullover (with a well-endowed woman on a cruise ship seen through what appears to be a telescope lens), and the aqua pouch pocketed Blue Seal, also the name of an elite regiment of adult film actors. 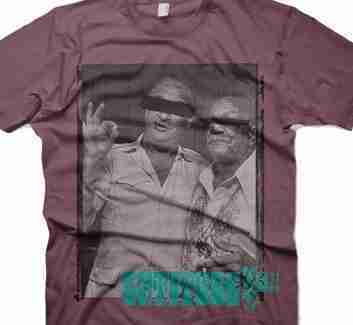 Choice tees include a purple Egyptian cotton featuring a pic of Rodney Dangerfield and Redd Foxx with their eyes black-boxed out, and an old television as the head of a dude dressed in a vest and button-down called The 80s Rewind, which wouldn't take nearly as long if your parents had splurged on a two-way tape rewinder, especially if it had a built-in AC power cord. If you just prefer to hide your faux-hawk, they've got caps like the 33 Fitted (with 33 degree coordinate on the front) and the self-explanatory Anchor, which also has a million uses, though all of them involve tatting up your grossly over-muscled forearms.